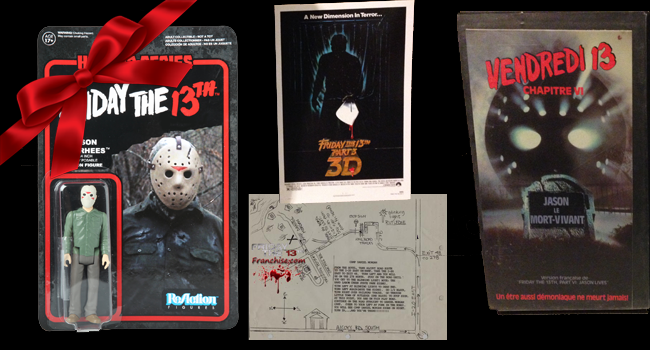 Last week we started a contest that gave our readers a chance to win an assortment of Friday The 13th themed goodies that included one Funko ReAction Jason Voorhees retro action figure, one VHS cassette for the French release of Jason Lives: Friday The 13th Part 6, one large postcard sized Friday The 13th Part 3 poster, and one first day shooting Call Sheet from the production of Jason Lives: Friday The 13th Part 6. The contest asked fans to let us know what your favorite Friday The 13th film(s) were to watch during the holidays. One of our readers was chosen at random out of over100 entries and we are now ready to announce the winner! Congratulations Donald T. Smith! You are the winner of the latest contest! Donald will be receiving an email from us shortly for shipping information. Again, congratulations and a great big thank you to all of our readers that participated in the contest! We really enjoyed reading all of your favorite films to watch in Friday The 13th franchise.